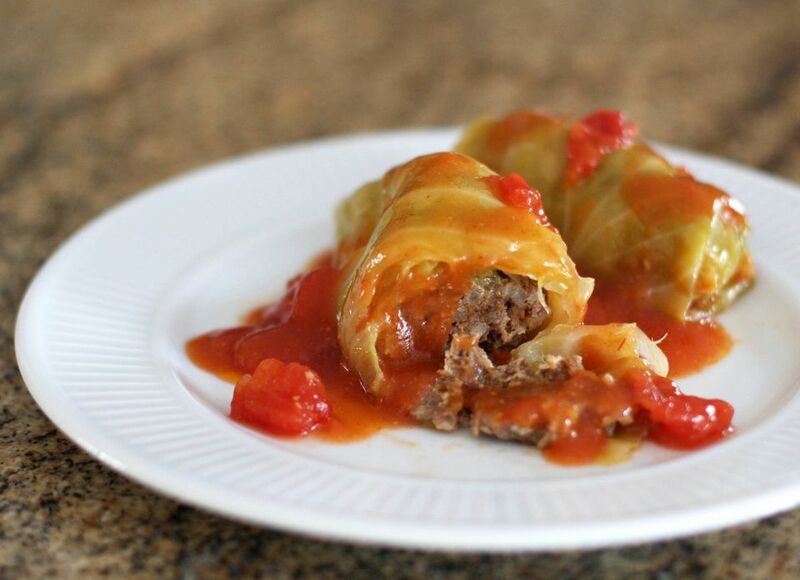 These cabbage rolls are baked in a baking dish with a tomato-based sauce. The mixture of ground beef, rice, and onion makes a delicious filling for the partially cooked cabbage leaves. The head of cabbage is frozen and then thawed, which softens the leaves and makes them easy to peel and stuff. Freeze the whole head of cabbage for several hours or overnight. Let thaw for a few hours, then cut around the core and gently peel leaves off (starting at core end) under warm running water. They should be flexible enough to stuff. If not, steam gently to soften. If you are starting with a fresh unfrozen head of cabbage: Peel and drop the cabbage leaves into boiling salted water. Cover and cook for 3 minutes or just until pliable. Drain well. Heat the oven to 350 F (180 C/Gas Mark 4). For filling, combine ground beef, rice, onion, egg, paprika, and salt, pepper, and milk. Mix well and divide into 12 portions. Place a portion of the ground beef mixture into the center of a cabbage leaf. Roll leaf around filling; fasten with a toothpick. Place in a baking dish or Dutch oven. Repeat with the remaining ground beef and cabbage leaves. In a bowl, combine the tomato sauce, tomatoes, sugar, vinegar, and 1/2 cup of water. Pour sauce over cabbage rolls. Cover tightly with a lid or foil and bake for 1 hour to 1 hour and 15 minutes, or until cooked through and cabbage is tender. Remove the cabbage rolls to a bowl with a slotted spoon. Take out the toothpicks and discard. Place the pan with juices over medium heat or transfer the juices to a saucepan and place over the heat. Combine the cornstarch with 3 tablespoons of cold water and mix until smooth. Stir the cornstarch and cold water mixture into the sauce; bring the sauce to a boil and cook until thickened. If you don't have time to freeze the cabbage, place the whole head—cored or not—in a microwave-safe dish with a small amount of water and microwave it on full power for about 10 to 15 minutes. The leaves should peel off nicely.